Research and scholarship are at the heart of Queen’s and feed into all that we do. Academic staff are involved in research and development in a wide range of areas, and many Queen’s staff are prominent in their fields of study. In addition, we have around 20 research students currently enrolled on doctoral programmes, working both full- and part-time. Research students may be resident at Queen’s, live locally or further afield or, in some cases, undertake research as international split site students, living and working in other countries and making occasional visits to Queen’s. Students and staff meet regularly in research seminars, supervisory teams and other contexts, such as workshops, classes, conferences, book launches and the annual residential visit to VU Amsterdam. All of this makes for a lively and diverse research community. 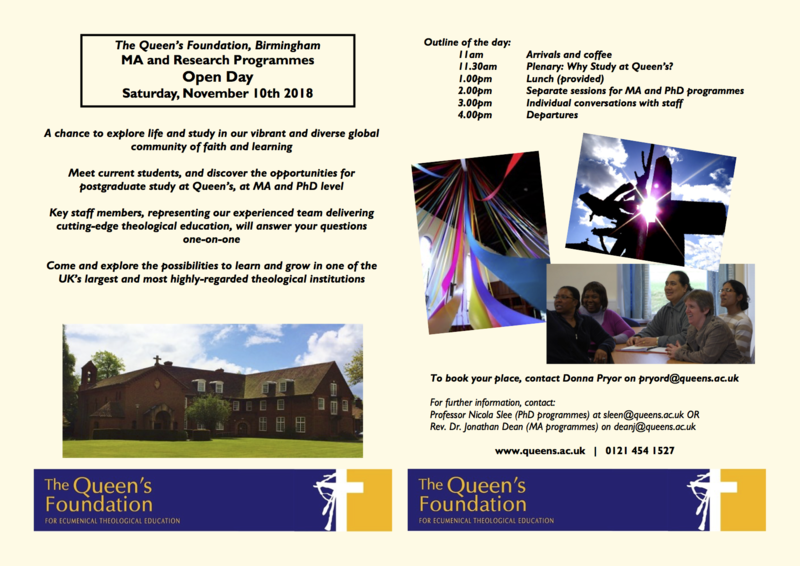 Queen’s offers a unique mixture of top-class theological education, drawing on the resources and expertise of a world renowned university Faculty of Religion and Theology at VU Amsterdam, with belonging to a closeknit, supportive environment of a lively and diverse ecumenical Christian community. Both students and staff benefit from this interchange between rigorous academic scholarship and the imperative of faith which is at the heart of Queen’s mission. Academic scholarship critiques, challenges and deepens the faith experience and convictions we bring, whilst personal and ecclesial faith strengthen and motivate academic learning. The experience of doing research in such an environment is a formational and transformational process in which we can expect to grow both in academic confidence and ability, and in maturity of faith and discipleship. Queen's staff bring not only their specialist knowledge of a discipline, but also their commitment to research that will serve the mission of God in the world. On the one hand, we believe that the purpose of theological research is ultimately missiological – resourcing, critiquing, and stimulating the Church in its mission. On the other, our conviction is that our missiological goal is best achieved by nurturing intellectual curiosity and rigour over the range of theological disciplines. As well as excellent supervisory support, you will have full access to our own library which stocks around 50,000 books and 80 current journal titles, with access to a further 300 titles online. We add around 750 new books each year to maintain the library’s reputation for excellence.